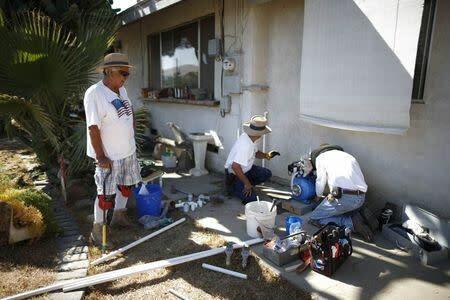 East Porterville Calif. (Reuters) - In one of the towns hardest hit by California's drought, the only way some residents can get water to flush the toilet is to drive to the fire station, hand-pump water into barrels and take it back home. 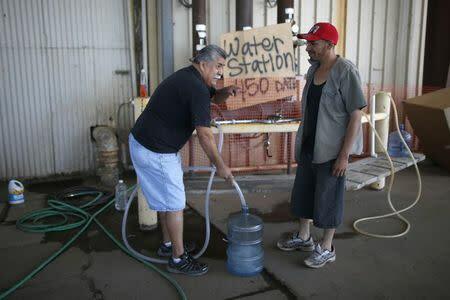 The trip has become a regular ritual for East Porterville residents Macario Beltran, 41, and his daughters, who on a recent evening pumped the water into containers in the bed of his old pickup truck to be used for bathing, dish washing and flushing. As if to emphasize the arid conditions that led them there, an emergency broadcast warned of a brewing dust storm. The state's three-year drought comes into sharp focus in Tulare County, the dairy and citrus heart of the state’s vast agricultural belt, where more than 500 wells have dried up. Donna Johnson's tap went dry in June. Since then she's been trying to help neighbors connect with help from the county and the state. 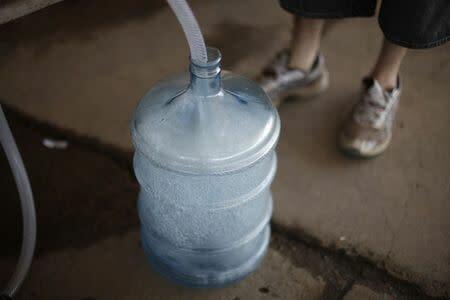 She began making door-to-door deliveries of water donated by charities and such supplies as hand sanitizer – often in withering 100-degree heat. “I saw all these people who couldn’t take a shower: kids, pregnant women,” the 72-year-old said. Gov. Jerry Brown, who declared a state drought emergency in January, signed an executive order last month to buy drinking water for residents with dry wells. He also signed bills to regulate groundwater. Andrew Lockman, manager at the Tulare County Office of Emergency Services, said it could be years before the groundwater management plan yields results. Meanwhile, some farmers have paid exorbitant rates for irrigation, while others have culled herds, axed fruit trees and fallowed fields, he said. Migrant farm workers have left to seek employment elsewhere. During wet years, farmers can buy water for irrigation from massive state and federal water projects, fed by snowmelt from the nearby Sierra Nevada mountain range, and residents tap shallow groundwater. But this year, they were able to purchase only a fraction of the water they needed, turning to expensive suppliers or digging deep to tap water that pools below the ground. Larger farms have spent up to $1 million to drill 2,000 feet into the Central Valley’s ancient aquifer, Lockman said. But individual residents, whose wells are not so deep, have a harder time of it as the water supply shrinks into the earth.